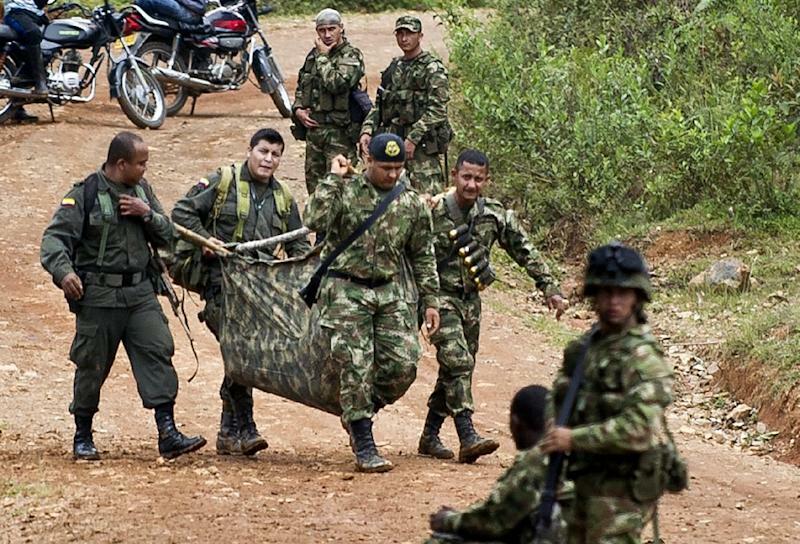 Bogota (AFP) - Suspected FARC guerrillas killed 10 soldiers and injured 20 others in a pre-dawn attack in western Colombia on Wednesday prompting President Juan Manuel Santos to order a resumption of air strikes against the rebels. The attack in a remote mountainous area in Cauca province was one of the deadliest since the government opened peace talks with the Revolutionary Armed Forces of Colombia (FARC) in Havana in November 2012. "I have ordered the armed forces to ignore the order suspending bombings of FARC camps until further notice," Santos said in a televised speech. "Let this be clear to the FARC: I'm not going to be pressured... by vile acts like this to make a decision on a bilateral ceasefire," he added. 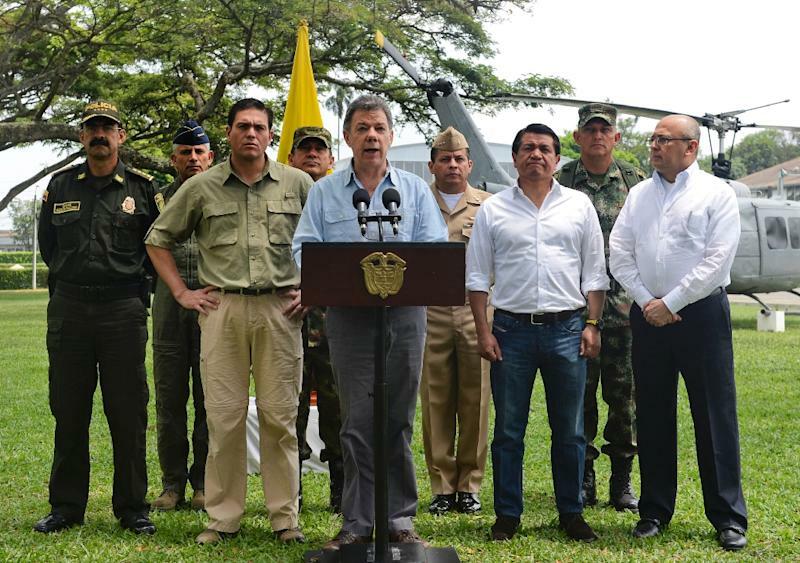 Less than a week ago, the president had extended a suspension of the air strikes for 30 days in recognition of a unilateral ceasefire by the FARC. A senior military official said the infantry troops were ambushed by FARC rebels as they conducted a patrol in an area considered a FARC stronghold. "They were attacked with explosives, grenades and firearms," Brigadier General Mario Augusto Valencia, the commander of the army's Third Division, told reporters. Cauca Governor Temistocles Ortega told Blu radio the soldiers came under fire in a hamlet known as La Esperanza. Military officials said 10 soldiers were killed and 20 others injured, three of them seriously. A search of the area also turned up the body of a guerrilla armed with a rifle and dressed in black, they said. The wounded were being evacuated with the help of the Red Cross and emergency personnel, but bad weather and the remote location were hampering the operation, Valencia said. The FARC has observed a unilateral ceasefire since December in a bid to advance the peace talks. Santos reciprocated by suspending air strikes on the rebels for 30 days, which he extended less than a week ago for another 30 days. However, he has long refused to commit to a bilateral ceasefire until there is a comprehensive peace agreement ending the half-century conflict. "We deplore the deaths of the soldiers in Cauca. This is precisely the war that we are trying to end," Santos said on Twitter. In Havana, a FARC spokesman expressed regret over the bloodletting, but blamed the government's "incoherence in ordering military operations against a guerrilla force observing a truce." "Whether it was an ambush or a counterambush, what we have before us is some dead Colombians," said the spokesman, Pastor Alape, calling on the government to join the FARC in a ceasefire. Santos, who met the army's high command to examine the circumstances surrounding the attack, traveled to the site where the soldiers were killed. "The armed forces must and will confront with maximum firmness all those who violate the rights of Colombians," the defense ministry said in a statement. Jorge Restrepo, the head of a research center that specializes on the Colombian conflict, said the attack was a "serious" blow but doubted it would lead to a breakdown in the peace talks. He added that it might even serve "to accelerate the negotiation of a definitive ceasefire in Havana." The public defender for human rights, Jorge Armando Otalora, denounced the guerrillas' "rupture of the unilateral ceasefire," calling it "an open contradiction with the discourse of the FARC negotiators in Havana." The attack also aroused opponents of the peace talks, led by former president Alvaro Uribe, a popular figure in Colombia for his hardline campaign against the FARC from 2002 to 2010. "Santos's peace is the extermination of the armed forces," Uribe thundered on Twitter. "Santos, please don't deceive us any more, don't justify the assassination of our soldiers with the story about 'the war that wants to end.'" 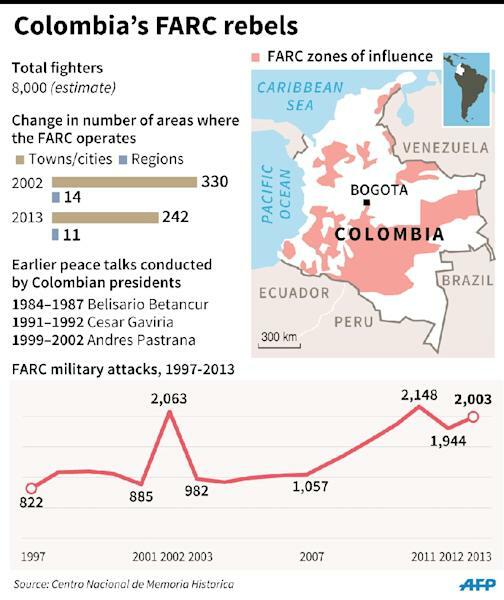 Formed in 1964 amid a peasant uprising, the FARC has an estimated 8,000 fighters, deployed in rural areas of Colombia. More than 200,000 people have died and another five million have been uprooted as a result of the conflict.